Jim Eckert is a military chaplain in Afghanistan. 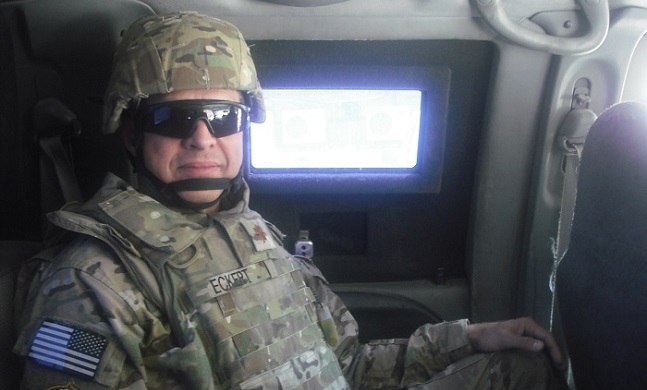 Jim Eckert serves as pastor of Lutheran Church of the Good Shepherd in Brooklyn, Ohio, but there is another part of his call and vocation that takes him away from his congregation to a whole different world of ministry — Jim is also a U.S. Navy Reserve chaplain currently deployed in Afghanistan. 1.) A service star is displayed in the side door of our building along our entrance drive. 2.) Jim and his family are part of our weekly intercessions during Sunday worship. We also offer prayer for all military personnel — active and reserve — as well as veterans. 3.) A congregation member crafted patriotic ribbons to be worn in support of Jim. A supply of these ribbons is available on our narthex table for anyone to take and wear. 4.) Congregation members are encouraged to keep in touch with Jim; his contact information is available on our narthex table. 5.) So far, we have had two opportunities to Skype with Jim. This has been mutually supportive for both pastor and congregation members, as we enjoy conversation together in spite of the miles that separate us. 6.) Recently, five boxes of “comfort items” (soap, deodorant, lotion, etc.) were sent to Afghanistan for distribution to military personnel as Jim carries out his ministry. 8.) All written updates we receive from Jim, including photos, are shared in our church newsletter and also Constant Contact, which allows us to share important information with our congregation members via email. 9.) On Sept. 8, Good Shepherd took part in “God’s work. Our hands.” Sunday. This was our opportunity to invite military families and veterans to join us for lunch, fellowship and a Skype visit with Jim. One point lifted up at our gathering was that we are fed at the Lord’s Table so that we may feed others. Jim, his family, and other military families need our compassionate care. We respond with love in Christ. This event helped to raise awareness among congregation members of what is happening in Afghanistan, and the needs of those who serve and of their families. 10.) Marilyn Jacobcik of the Ohio Secretary of State’s office presented Jim with a special commendation during his Skype visit. A commendation was also presented to the congregation for our efforts to support military families. Good Shepherd plans to frame and display these special commendations. 11.) Another special guest that day was Gary Rezabek, national director of the 82nd Airborne Division. Gary shared an inspirational talk about supporting active military families. He also provided 200 flags that were displayed around the church building on the day of the event. We were allowed us to keep these flags and plan to display them again when Jim returns home from his deployment. 12.) Now, we hope to support local military families through the holiday times. We have been in touch with the Northeast Ohio Foundation for Patriotism and they are providing information on adopting a family at Christmas. “God’s word keeps urging us outward, beyond ourselves; so this newly conceived ministry for Cleveland’s veteran and active military families keeps Pastor Jim and his family foremost in prayer but also keeps us aware of the special needs of service personnel as they return from active duty. And all this in the name of Christ the Good Shepherd,” says David of their ever-expanding ministry.